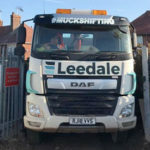 Our fleet of 8 wheel 30/32 tonne tipper lorries specialise in all types of contract earth moving and tipper hire for daily, nightly or long term private or corporate hire. We aim to safely remove any surplus material from your site with minimum disruption and at a cost effective price. 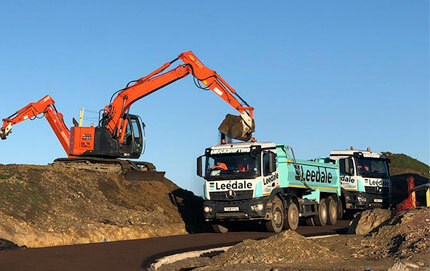 Leedale offers their customers a full package including demolition of buildings down to ground level, giving a full regeneration of your site ready for building works to commence. We pride ourselves in providing an extremely professional service and offer a complimentary site appraisal. All our operatives are fully certified, courteous, knowledgeable and CPC qualified. Our coverage areas include the Midlands, Derbyshire, Nottinghamshire, Leicestershire, East Midlands, South Yorkshire, Staffordshire including Alfreton, Clay Cross, Chesterfield, Mansfield, Nottingham, Derby, Burton On Trent, Leicester and Nottingham. Each delivery vehicle is fitted with reversing cameras for added safety. All the above services are carried out in accordance with current legislation providing all our customers with Waste Transfer Notes and our Waste Carriers Licence. We can provide Method Statements & Risk Assessments upon request. We offer a fast, flexible and reliable service with an extensive coverage in the Midlands. All our drivers are experienced to collect and deliver all types of materials, working on a load basis, price per tonne, day / night work or on a contract price basis.